Below are the parts of a Western saddle shown on two illustrated photos. The first image shows the parts of a saddle while the saddle is on a saddle stand. We thought some of the parts might be a bit difficult to see, so the second photo shows a few of the same parts while the saddle is on a horse. Beneath the photos there's also a brief description of each of the saddle parts. You might also like: How To Measure a Western Saddle Seat and What Are Saddle Rigging Positions? Image #1: The parts of a Western saddle. Image #2: These are some of the same parts of a saddle as shown above, but they're easier to see in this photo. Also shown is the front cinch and breast collar, which weren't shown in the first photo. 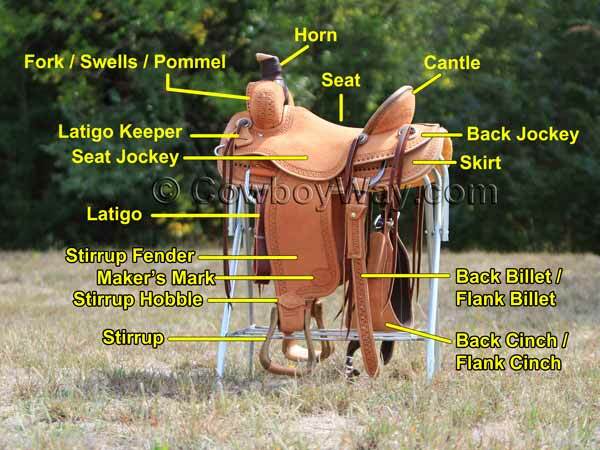 Below is a brief description of the parts of a Western saddle. They are in order, more or less, from the top of the saddle to the bottom. Fork / Swells / Pommel - This area, as you can tell, goes by several names. In a Western saddle this area is commonly referred to as the fork or swells, and is occasionally referred to as the pommel. In an English saddle this area is usually exclusively referred to as the pommel. Horn - The horn (aka "saddle horn") might be the most recognized part of a Western saddle. A saddle horn's best known purpose is to secure one end of a rope while the other end is on a cow, calf, or whatever it is the rider has roped. Saddle horns are useful for other things, too: For example, they’re handy to use when mounting or dismounting, and they're a great place to hang pommel saddle bags. Seat - Where the rider sits when riding. Cantle - The back of the seat. Latigo Keeper - This is a small tab with a horizontal slit. On a saddled horse, it holds the excess length of the latigo. You can see an example of this in image #2. Latigo - This is the strap, often made of leather but sometimes made of nylon, that is used to secure the front cinch to the horse. In image #1, the latigo is neatly folded up and is difficult to see. That's because this image shows a saddle this is brand new, and has never been on a horse. You can get a better look at the latigo in image #2. Seat Jockey / Back Jockey - The jockeys cover parts of the saddle beneath them that would otherwise be exposed. Some saddles (for example, some barrel racing saddles) are designed without a back jockey; this is often a feature designed to cut down on the weight of the saddle. The jockeys are also sometimes called "housings," as in "back housing." Skirt - The skirt (aka "saddle skirt") is attached to the saddle tree and extends down the side of the horse. The underside of the skirt is lined with sheepskin (real or imitation). Stirrup Fender - The stirrup fender (sometimes just called the "fender") attaches to the saddle at the top and holds the stirrup at the bottom. Stirrup Hobble - This is the strap that goes around the bottom of the stirrup fender just above the stirrup. While the stirrup hobble seems to be a humble saddle part, it serves an important purpose: Without the stirrup hobble the stirrup could leave its correct position at the bottom of the stirrup fender and travel freely up the length of the fender. Stirrup - This is where the rider puts their foot when riding. Maker's Mark - This is an identifying stamp used by the saddle maker to identify a saddle they have made. Many, but not all saddles have a maker's mark. Common places to find a maker's mark include the stirrup fender, the latigo keeper, and/or the stirrup hobble. A maker's mark can be located in any place, or several places, that the maker chooses to put it. Front Cinch - The front cinch goes underneath the horse at the front of the saddle. It is attached to the saddle on the right side (or "off side") with a strap called a "billet" or "off billet" (not shown). 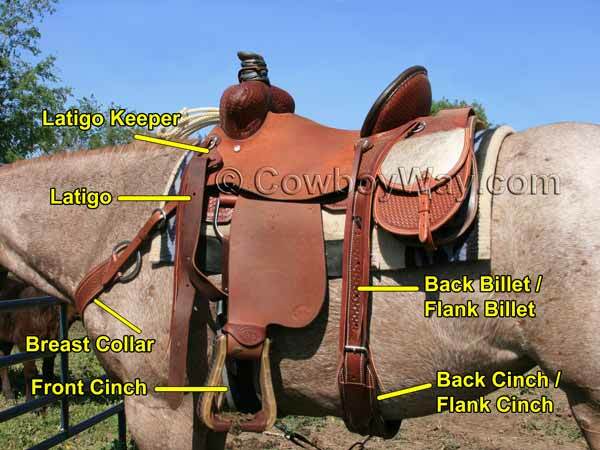 It is attached to the saddle on the left side with the latigo. Back Billet / Flank Billet - This strap extends from the back rigging down the sides of the horse where (when the saddle is on a horse) it is buckled onto the back cinch. Back Cinch / Flank Cinch - The back cinch goes underneath the horse at the back of the saddle. It is buckled to the saddle with the back billets. The back cinch keeps the back of the saddle held down close to the horse's back during roping or riding on uneven ground. Not Labeled - In image #2 you can see a small strap (partially visible at the very bottom of the photo) that connects the back cinch to the front cinch. This strap goes by several names: Cinch connector strap, hobble strap (not to be confused with the stirrup hobble), connecting strap, and others. It is a small strap and it seems everyone has a different name for it, but it's an important part of a saddle. Without this small connecting strap the back cinch could slide too far back. At best, this means the back cinch might not be able do its job effectively. At worst, it could provoke some horses into spooking or bucking. Breast Collar - Technically, a breast collar is not a part of a saddle. Instead, it's a piece of equipment commonly used with a saddle, so we're mentioning it here. A breast collar is attached to the front of the saddle (it can be attached in several ways and at different places). Its main purpose is to keep the saddle from sliding too far back, but in some cases it can also be helpful to keep a saddle upright on a horse if it tries to tip to the side.